Update: The following is just one tiny slice of what I heard on Tuesday. For a very detailed account from Zoltán Glück and Manissa McCleave Maharawal, head to Racialicious. I woke Tuesday, as many others did, to Facebook posts and emails and headlines about the police raid on Occupy Wall Street. I kept an eye on Twitter and retweeted a couple of things that resonated with me. After work I went down to the General Assembly, or GA, meeting at the square. There were a lot of police and a LOT of people. It was my first time really experiencing the human microphone, or the people’s mic, in all its glory. Hundreds of people listened and parroted the announcements and rallying cries. 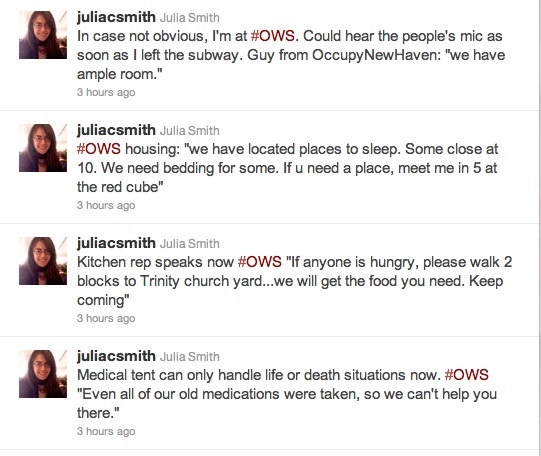 Some related to logistics – should OWS keep people in the park awake, all night, and occupy in shifts? One guy pleaded with the crowd to explore the idea of finding “a space with a roof” and turning OWS into a “legitimate, real nonprofit.” This was met with a stonier reception, but he had his time to speak. Another person described the lewd treatment of women in jail last night, and invited anyone who didn’t think women should be treated that way to march in solidarity immediately following the night’s General Assembly. At various points the facilitators would ask the crowd to sit down on benches or the pavement if they were able; this makes it easier for the sound to ripple back. I like this idea. I’m going to document some of those signs tomorrow. Next, some folks from one of the working groups suggested that this enormous crowd break into groups to talk about possible steps forward. But this was relatively short-lived. On one side of the plaza, some groups did begin to meet. On the other, something happened—I was a little too far away to understand what—and folks started chanting at the cops. And meanwhile, the facilitators were receiving conflicting bits of information. Still, facilitators encouraged folks not to give up on the dialogue. The emphasis was on talking, talking, talking to one another. Meanwhile, the mic checks continued with people “on stack.” Someone declared that, as a resident of Harlem, she could spend five nights a week at the square and give up her bed to others who might need it. Another person got up and asked that those of us who cannot attend the day of action this Thursday at least start a conversation with our coworkers about what’s happening. Then Heidi’s name was called. She got up on a bench and began. She spoke as a native New Yorker and the powerhouse organizer that we at RISE know her to be. She urged folks to recognize that this is not about one group of people who were arrested last night; this is about people who are arrested every day, the organizing that takes place around that and other issues every day. “Occupy the Hood,” she implored. I left around 9:30. The mic checks were still going strong. This entry was posted in People, Places, Revolution and tagged New York, Occupy Wall Street, twitter. Bookmark the permalink. Thanks for this, Julia. It’s nice to get this kind of update on what’s going on over there. Thanks for being a great journalist!